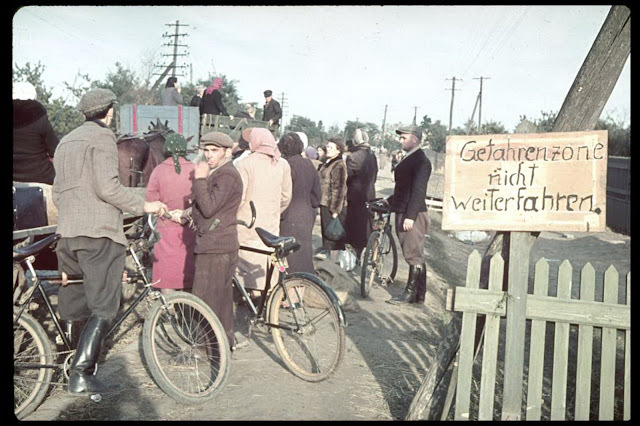 Polish refugees clog the streets near Warsaw despite the Sign (in German) that reads: "Getahrenzone - Nicht Weiterfahren" (Danger Zone - Do not Proceed). The picture was taken by German photographer Hugo Jaeger. During the Wehrmacht siege of the Polish capital (8-28 September 1939), around 18,000 civilians perished. As a result of the air bombardments 10% of the city's buildings were entirely destroyed and further 40% were heavily damaged. From the very first hours of World War II (1 September 1939), Warsaw was a target of an unrestricted aerial bombardment campaign initiated by the German Luftwaffe, which was controlled by Generalfeldmarschall Hermann Göring. Apart from the military facilities such as infantry barracks and the Okęcie airport and aircraft factory, the German pilots also targeted civilian facilities such as water works, hospitals, market places and schools, which resulted in heavy human casualties that possibly led to the early surrender by lowering of morale of the Polish army defending the city.